The Macro Flash Shoe Ring carries 2 plastic accessory shoes that are designed for the heads of the T28 Macro Twin Flash 1 and the T28 Macro Single Flash 1. The Macro Flash Shoe Ring can be fitted to lenses that take either 49 mm or 55 mm filters; this includes the Zuiko Auto-Macro 20mm f/2, Zuiko Auto-Macro 38mm f/2.8, Zuiko Auto-Macro 50mm f/3.5, the Zuiko Auto-Macro 50mm f/2, the Zuiko Auto-Macro 90mm f/2, the Zuiko Auto-1:1 Macro 80mm f/4 and the Zuiko Auto-Macro 135mm f/4.5. 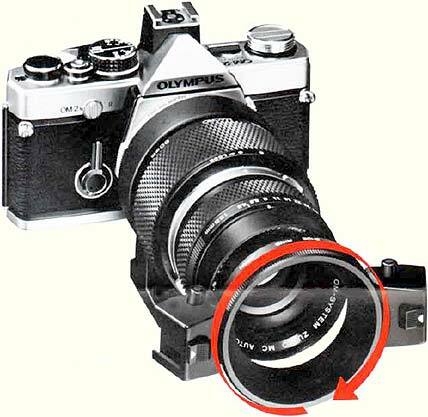 It is much easier to screw the Ring onto a lens (and to remove it) without the flash heads attached. The accessory shoes are angled inwards at 20°. They are designed for the heads of the T28 Macro Flash 1, which are light because they do not contain batteries. 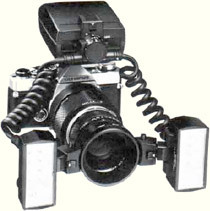 The shoes may be able to take other light-weight flash guns, although Olympus warns against this. The shoes can be moved around the ring when the 2 black buttons on either side are held in; releasing the buttons locks the shoes in place. 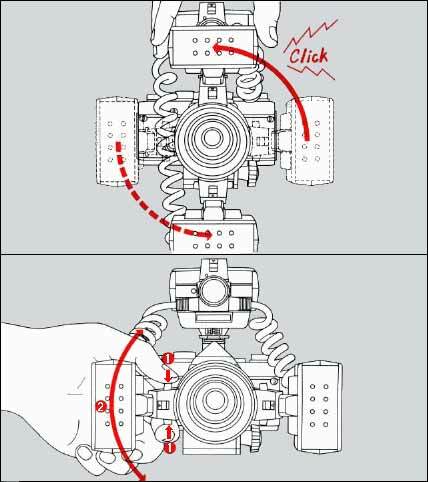 The T28 heads lock into place in the shoes; to remove them, push the button on the front face of the shoe in the direction of the white arrow, and then slide out the head.